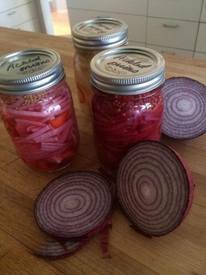 Pickling is a great way to save all that wonderful harvest for the dark days of winter. Most people think cucumbers when they think of pickles, but you can pickle almost any vegetable, including onions, cauliflower, green beans and radishes. And most people think pickles have to be heavily salted, but you can make refrigerator pickles (also called fresh pack pickles) with no salt at all. I especially like making pickled red onions. They last all winter in my fridge and are a great addition to pulled pork sandwiches, tacos, green salads and both potato and egg salads. Try them stir fried with kale and turmeric for a savory fall side dish.